Although the dog-lover in all of us (you know, the voice in your head that gasps every time you see a cute pup) wants to pet each furry friend you come across, we’re here to remind you that’s not always a good idea. All dogs are capable of biting, so stay smart by following these tips for dog safety. Always ask if it’s alright for you to pet someone’s dog. Not only is it polite, but the owner will warn you whether or not their dog is friendly. Don’t make assumptions about dogs based on their breeds. Not every retriever wants a head scratch. Likewise, not all “aggressive” breeds are actually aggressive. Dogs’ behaviors are very dependent upon the environment they were raised in. Their body language isn’t something that’s necessarily easy to read, either. A wagging tail does not always indicate a friendly dog. Stay calm if you are approached by an unfamiliar dog. Be still and quiet so as not to scare the dog. Let the dog see and sniff you before you pet them. Respect their space Even friendly dogs are territorial by nature. Don’t provoke dogs by placing your hands on their property. Even approaching their owners can make them agitated, so it is best to let them familiarize themselves with you first. Watch your kids closely and teach them how to play with dogs safely. Children should always be supervised around dogs, especially ones they don’t know. They should generally avoid dogs who are sleeping, eating, chewing on a toy, or caring for puppies. They should never approach a dog that is barking or growling. If they are approached by an unknown dog, they should know not to run, but to stay still and avoid eye contact. Protect yourself if you are being attacked. In the worst case, if a dog is already confronting you, place whatever you can between yourself and the dog- a purse, jacket, or otherwise. Curl up, tuck your head in and use your arms to cover your ears and neck. 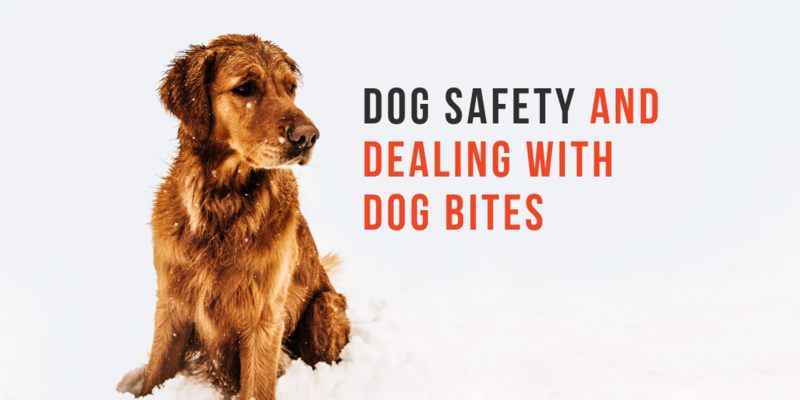 With these tips in mind, it is still important to recognize that most dog bite incidents involve a person who is already familiar with the dog. So, what happens if you are bitten? Remove yourself from the dog’s environment. If you know the owner, calmly discuss the situation so that you can properly document it. If you do not know the owner, exchange information and be sure to do the same with any witnesses. Seek treatment immediately. Dog bites can cause infections and are handled best by a doctor, rather than home treatment. You’ll want to be able to tell the doctor if the dog is up-to-date on all vaccinations, including rabies, if the dog was provoked, and if you know the owner. Clean the wound if you are not able to get to a doctor quickly. Apply pressure with a clean towel, wash the area gently with soap and water, apply a sterile bandage and elevate the injury. While you would treat it like many other injuries in this case, it is still important to seek out a physician for examination after a dog bite to avoid infection. Plan your next steps. Document everything about the incident with pictures and descriptions as soon as you can. This will help facilitate any further legal action if necessary. Call (833) Cappy Law to obtain the correct care you need and the legal outcome you deserve.